Afterwards, click on an address book to open it. Alternatively, you can access the address books via the ribbon. 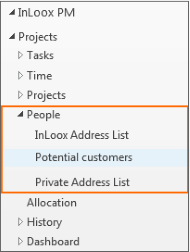 Therefore click on the InLoox now or InLoox PM tab and then on People. The InLoox address list will open. To open another address book click on Address Book in the Start tab and choose an address book from the drop-down-list. Address book view • Copyright 1999-2019 © InLoox, Inc. All rights reserved.